The Local Bouquet’s adorable logo depicts the studio’s farm-focused spirit. 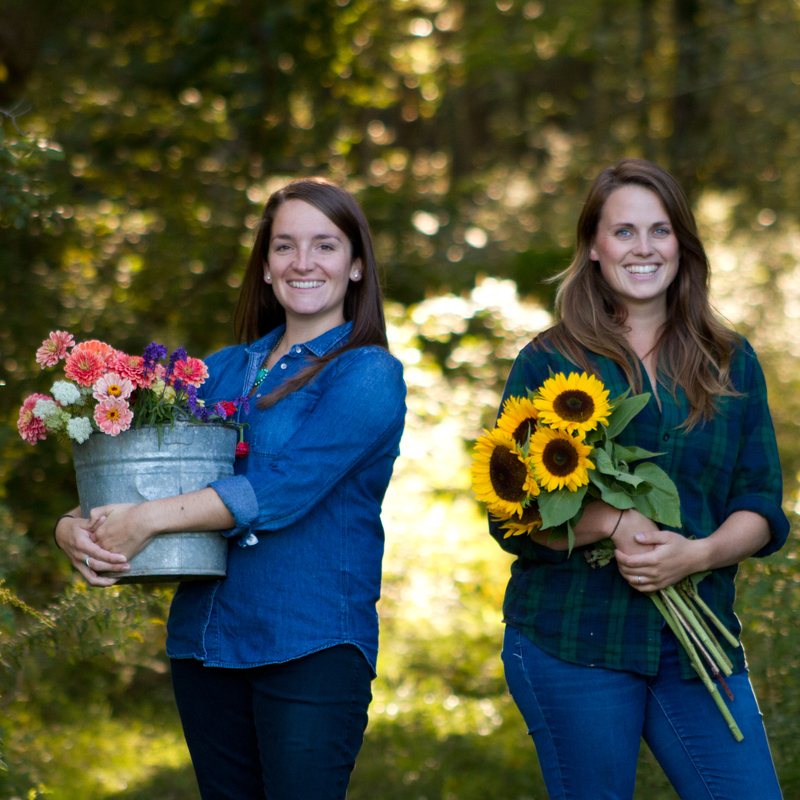 Today’s interview was inspired by an email I recently received from Mary Kate Kinnane and Maureen Azize, partners in The Local Bouquet, based in Little Compton, Rhode Island. 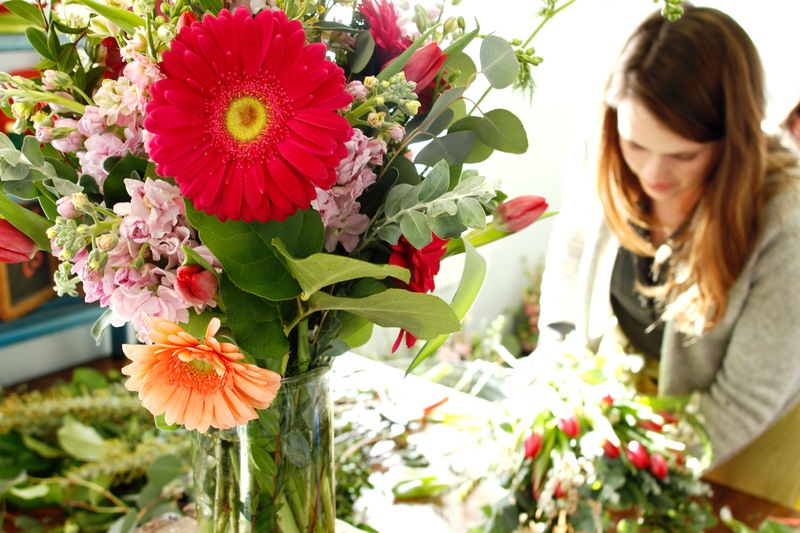 Their full-service floral design studio uses locally and domestically grown blooms for every occasion – and it’s their dedication to this philosophy that prompted them to reach out to me. Mary Kate (left) is the studio’s wedding and event coordinator; Maureen (right) is the field coordinator and director of cut flowers. Their letter was just one of several similar “cries for help” from Slow Flowers believers around the country, including Justine Lacy and Jessica Stewart of Foxglove Brooklyn Floral Design Studio, who were my podcast guests two weeks ago. 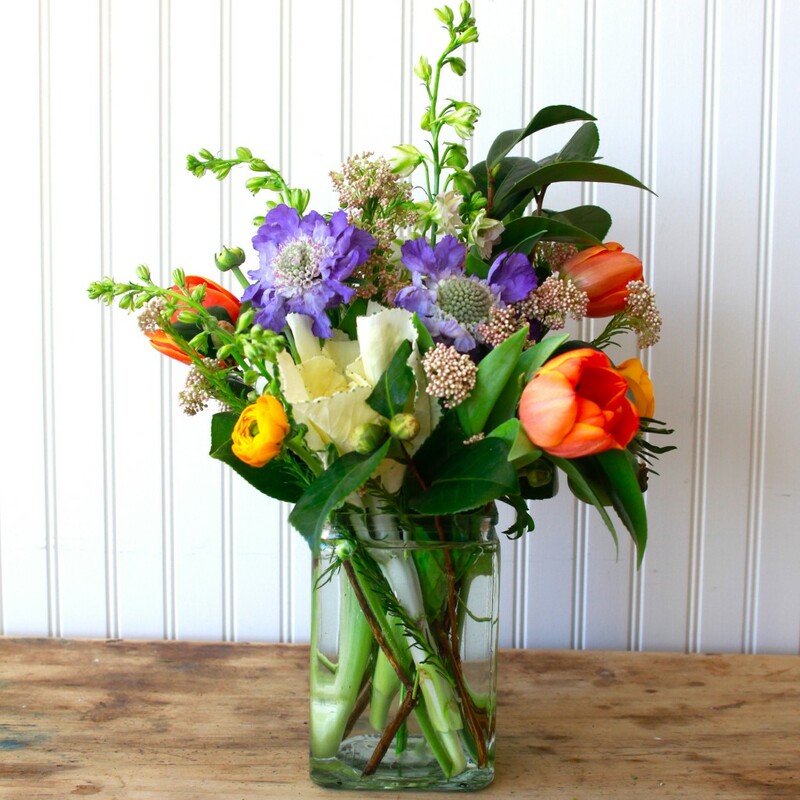 The essential question is this: HOW CAN SMALL FLORAL BUSINESSES MOTIVATE THEIR WHOLESALE SUPPLIERS TO OFFER AMERICAN GROWN FLOWERS FROM LOCAL FARMERS AND OTHER DOMESTIC SOURCES? A seasonal arrangement from The Local Bouquet. Let me start by introducing myself. 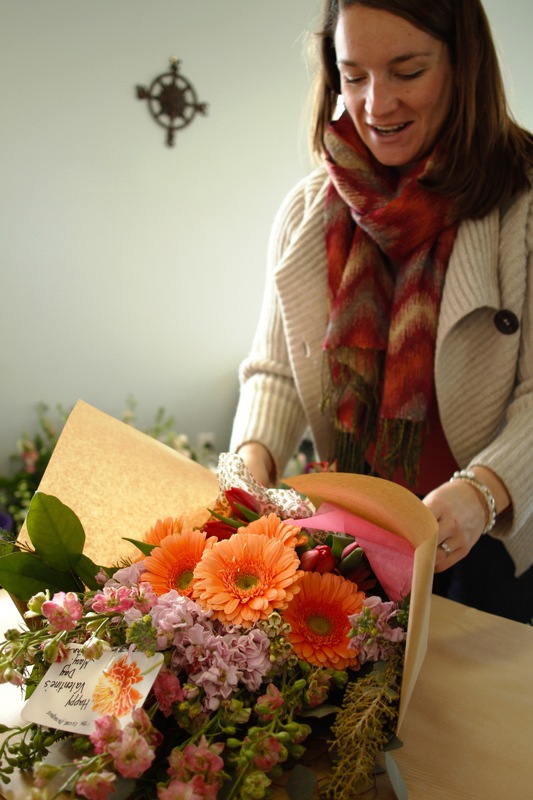 My name is Mary Kate and I am co-owner and co-operator of The Local Bouquet, a full service floral design studio in a small town in Rhode Island. My business partner Maureen and I are both 26 years old, newly married and new mothers too. We started our floral company one year ago, providing people with only locally and domestically grown blooms in all of our designs. We have spent the past year educating our customers on why local and U.S. grown in better and why place of origin is important to think about when it comes to the flowers in their lives. No one in our area is providing the public with this type of product and so as a result customers are new to this “field to vase” movement. Mary Kate in the studio. We really have learned a lot in the past year from you and all of the educational media you are sharing, so I want to thank you for that. We need your help and expertise though! We realized when we started our business with this unique mission that it would be a challenge to get our hands on local and domestically grown blooms throughout the year, especially in our area of the country. We never imagined just how big that challenge would be though. In the past five months we have educated ourselves at the flower market, only buying what is U.S. grown, which is a very small list. When we ask our sales reps if they would ever buy more local blooms, they shake their head no and laugh! So lately we have been taking it upon ourselves to talk to the farmers directly. Some of the popular no-rose Valentine’s Day bouquets created by Mary Kate and Maureen. We have reached out to farmers not just in the New England area but also on the eastern seaboard and the West Coast. We have had disappointingly little luck. All of the farmers outside of our state are not interested in selling to small businesses like ours. They all give us the same speech about how we need to guarantee them big numbers on a weekly basis for them to want to ship all the way to R.I. So how are we supposed to join this “field to vase” movement if we aren’t located where all of these big U.S. flower farms are? Does that mean we are automatically out and we only get 3 good months out of the year to make it as a business? We would like to think not, but lately with all of the defeat it’s hard not to. 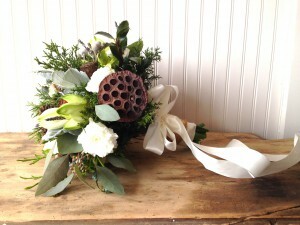 Here’s what a winter bridal bouquet looks like in Rhode Island. Stunning! This is where we need your help. How do we get our hands on more blooms from the U.S.? How do we convince these farmers that even though we are small and just starting out, it is an investment to work with us and one that will grow the “American Flower Farmer” movement. Do you know of any farms that would be willing to sell/ship to us? Do you have any recommendations for us as florists who are trying to support the local and domestic farmers? Any help you could give us would be greatly appreciated! By the way, we thoroughly enjoy your podcasts week-to-week! This might be an interesting topic to discuss; the florist need for more local and domestic blooms and the farmers thoughts to selling and shipping to small time businesses like ours. Maureen in the design studio. 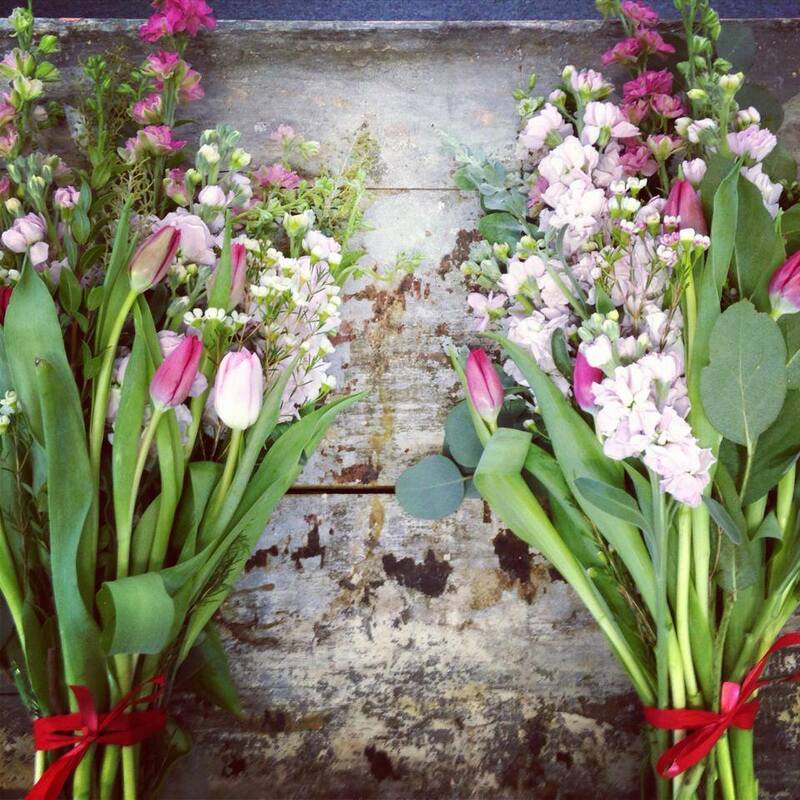 To put it simply, we are two women who LOVE flowers! Sisters-in-law and best friends, we love being outside, getting dirty in the gardens, and being creative in our designs. 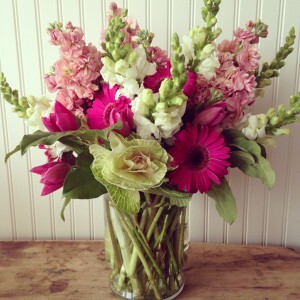 With backgrounds in floral design, gardening, and landscape design, our mission is to bring you the freshest locally and USA grown flowers, including blooms from our own little flower farm. We design natural, free-flowing and elegant bouquets and arrangements, inspired by nature and tailored to meet our clients’ needs! Beautiful, fresh, seasonal and local! We certainly didn’t solve the Sourcing Conundrum in today’s conversation, but I am so grateful that we took the time to meet via a Skype interview. I feel like these podcast interviews provide insights and education to all of us who care about the origins of the flowers we purchase and design with. Because of the support from you and others, listeners have downloaded episodes of the Slow Flowers Podcast more than 10,000 times! I thank you for taking the time to join to my conversations with flower farmers, florists and other notable floral experts. This entry was posted on Wednesday, April 23rd, 2014 at 7:42 am	and is filed under American Grown, Blog Posts, floral design, General, Podcast Episodes, SLOW FLOWERS Podcast. You can follow any responses to this entry through the RSS 2.0 feed. You can leave a response, or trackback from your own site. This is a fantastic podcast and interview with Mary Kate and Maureen. Their story is one that we continue to hear throughout the country. I encourage The Local Bouquet to stay local! All I can say is that efforts are underway to help local designers throughout our country to have more access to American Grown blooms. Keep up the great work and keep the faith! So happy to have come across this. I am in the process of developing a similar approach here in my little area of Maine! I should love to connect with them and with you Debra about promoting this further on a local scale and ti get myself moving in this direction too! New England has such great potential for these sorts of businesses. Hope to speak with all of you soon!